Breville BFP800XL Review For 2019: Does It Beat Every Other Food Processor? If you have been wanting to cut down on time spent in the kitchen but still want to enjoy delicious homemade meals, you’ve probably looked into getting a food processor. From chopping to pureeing, to mixing and kneading, a food processor is a great addition to every kitchen. Food processors save energy and time, allowing you to savor your meal rather than be stuck slaving over it in the kitchen. When you have decided to buy one, there are a lot of food processors to choose from (see our list of the best ones here), and in order to start benefiting from minimal preparation time, you’ll want to invest in a high quality and efficient food processor. Breville is an Australian company with over 80 years of experience in creating small kitchen appliances. We’ve found their BFP800XL food processor to be one of the best on the market. Our review of the BFP800XL will help you decide if this food processor is right for you. If you think you need to know more, feel free to use the table of contents below to skim through the article! 1 What are the interesting features of the Breville BFP800XL food processor? 2 What do the reviews of the Breville BFP800XL say? 3 How Does The Breville BFP800XL Compare? 4 Where can I get replacement parts for the Breville BFP800XL? 5 Where can I get a refurbished Breville BFP800XL? 6 What’s the best price for the Breville BFP800XL and where can I buy it? 7 Verdict: is this food processor for you? What are the interesting features of the Breville BFP800XL food processor? Breville has realized that not all foods come in the exact same size or packaging. For this reason, they created the BFP800XL food processor with much-needed versatility to be able to accommodate and really work with a wide variety of foods, foods that are in most household kitchens. Made of stainless steel blades, a die-cast metal base, and a plastic bowl, this machine is durable. Equipped with a 1200 watt direct drive motor, this food processor is heavy duty enough to get even your toughest preparation done with ease. At 11 inches in diameter, 18 inches in height, 8 inches in width, it is easy to create room for the Sous Chef on your countertop. Breville created the BFP800XL with a 5.5-inch extra wide feed chute. With the mindset that food preparation should make life simple not more challenging, they’ve equipped the Sous Chef with that super wide feed chute to help you. By reducing the amount of time spent cutting fruits and vegetables to prepare them for the food processor, you have more time to do things you enjoy. The Breville Sous Chef food processor also includes a set of 5 discs and 3 blades with up to 24 different settings, providing more options for preparation. The variable slicing discs can be set in 24 different settings, allowing you to cut from a very thin 0.3 mm up to a thick 8.0 mm. With two options for bowl sizes, a larger 16 cup, and a mini 2.5 cup, it is convenient to take on any task no matter what your size portions are. From blending up large portions of soup or dough to processing a smaller portion of nuts or dips, the Breville BFP800XL is able to get the job done. The micro-serrated S blade makes this food processor stronger and more precise, helping you get through even your more difficult food preparation jobs. The other discs included in the set are a mini blade to be used with the mini bowl, a French fry cutting disc, a julienne disc, a reversible shredding disc, a whisking disc, and a dough blade to make kneading and combining ingredients possible. Both a small and large food pusher give you an improved control over processing smaller ingredients and help push food down the feed chute. The smaller food pusher also acts as a measuring cup to help add in ingredients with added precision. The food processor will run whether the small food pusher is in or out, while it will not start unless the large food pusher is in place. There is an LCD display that has a count up and countdown timer to ensure precision and consistency. Plus, the Breville Sous Chef comes with an additional box for proper storage of parts. This accessory storage box can be stored either horizontally or vertically without harming parts to best suits your storage space. As for safety, the Breville 16 cup food processor is not lacking. The feed chute safety system keeps the machine from running unless the bowl, lid, and large food pusher are locked correctly in place. The silicone seal prevents leakage from liquid ingredients, keeping your kitchen clean. As an added addition all parts that food will come in contact with are BPA free. And the non-skid rubber feet help keep the machine in place, adding stability and safety to your food preparation. And as an added bonus, the Sous Chef comes in three colors: stainless steel, cranberry red, and black sesame. Not only will the Sous Chef save you time and energy in the kitchen, it will also look good and fit in your kitchen seamlessly while doing it. What do the reviews of the Breville BFP800XL say? If you read through Breville food processor reviews, you will see that the Breville Sous Chef reviews are some of the highest. With an average rating of 4.5 stars, it is safe to assume that consumers are very satisfied with their Breville BFP800XL. With two common praises being how durable the food processor is and how it’s worth every penny spent on it. Not only are consumers pleased with the Breville BFP800XL’s high-end design, they are also pleased with its quality. Its 1200 watt induction motor put it above other food processors. That extra power really makes a difference and saves time in how long it takes to prepare the food before it is processed. They also love the 5.5 inches super wide food chute. The Breville BFP800XL makes it easier to work through large batches of food quicker and quieter. By using an induction motor, there is no noise other than the ingredients in the bowl. Consumers report being impressed by the sharpness and accuracy of the S blade, but also comment on the safety of the machine. One consumer reported the S blade being able to handle a variety of tasks with ease. They used the blade for making ground beef, ice cream, and simply just chopping herbs to name a few jobs. Another consumer reports this being “the best food processor on the market” after they were won over by the reliability of the silicone seals. They truly keep liquid in the bowl and prevent mold from growing underneath them. Previous consumers recommend hand washing the bowl to preserve its life and do not use a scouring sponge or abrasive cleaners. However, the bowl and lid are top-rack dishwasher safe. Though it is better not to prolong them to extreme heat or harsh detergents regularly. This food processor can be overwhelming because it has so much versatility. While that will excite the serious at-home chef, it shouldn’t scare the newcomer to food processing. They’ll only grow to enjoy the Breville Sous Chef more as they learn its tricks and abilities. How Does The Breville BFP800XL Compare? Generally speaking, the Breville BFP800XL blows other food processors away. However, there are a few other options that also get the job done. The Breville BFP660SIL is one of those. So what is the difference between the Breville BFP800XL and the Breville BFP660SIL? The Breville BFP660SIL is slightly smaller than the BFP800XL. At a 12 cup capacity, it is good for smaller families or groups while the 16 cup capacity is great for both families and entertaining. The Breville 12 cup food processor does not come with a mini bowl, which sets the 16 cup food processor ahead of it if you plan to use your food processor for a lot of dips or small jobs. The Breville BFP660SIL is equipped with a 1000 watt induction motor, versus the Breville BFP800XL’s 1200 watt power. However, the BFP660SIL comes with an additional momentary pulse button to make the most of that power and control, meaning your food processing will be even and consistent. Also, the 12 cup food processor does not come with as many discs or blades as the 12 cup, but it does come with three food chute options to help with precision. And lastly, the main comparison is the feed chute. The 12 cup comes with a 5-inch feed chute, while the 16 cup has a 5.5-inch feed chute. So the Breville BFP800XL really does save more time and energy compared to cutting down on the time needed for food preparation. If you do not need a lot of room or a lot of versatility but still want a durable, well-designed food processor, the Breville BFP660SIL is a great option for you. However, if you are looking to for more power, room, and options, the Breville BFP800XL will not let you down. With its extra options, precision, and power, it is no mistake it is called the Sous Chef. Where can I get replacement parts for the Breville BFP800XL? The Breville warranty includes one year of limited coverage, from purchase date and with proof of purchase. This warranty protects against defects in material or workmanship. Should you need to use your warranty, Breville arranges to have your product returned to them and a replacement sent to you free of charge. Breville prefers to work on their appliances themselves, as such do not return the product to the store. Also, note that the warranty does not cover any user abuse or damages incurred during repairs done by anyone other than Breville. If your food processor is past warranty or simply needs a new part, you can buy replacement parts from many online vendors. Even Breville themselves offer many replacement parts, such as a new lid or blade, on their website. This makes it simple to replace and swap out parts as wear and need indicate. Where can I get a refurbished Breville BFP800XL? If you’re looking to buy a serious food processor but also want to be friendly to your wallet, purchasing a refurbished machine is a great option to consider. Breville sells their products refurbished directly through their website. Though refurbished products only include a 6-month limited warranty instead of a 1-year limited warranty. If your appliance were to fail in the first 6 months of purchase, Breville would replace the product free of charge. You can also purchase refurbished products from online vendors such as Amazon. Breville has a strict policy for a product to become refurbished. All products are fully clean, inspected, tested, and rendered 100% functional. If you’re looking to save money and don’t mind a shorter warranty, purchasing a refurbished food processor is something to consider. What’s the best price for the Breville BFP800XL and where can I buy it? The Breville BFP800XL can be bought from a variety of retailers, both online from vendors like Amazon to in store at most big-box kitchen appliance stores. Most vendors also offer their own extended warranty, even Amazon offers optional coverage that is purchasable for a small fee. However, it is not available from every vendor, so it is smart to check with them for their most recent deals. While the Breville BFP800XL is on the more expensive end of food processors, it comes with features, durability and an unparalleled 25-year motor guarantee that make it worth every penny. Plus Amazon often runs weekly specials. So by checking in with them before purchasing, you are sure to get the best price! Verdict: is this food processor for you? If you’re looking for a high-quality food processor, you will not be disappointed with the Breville BFP800XL. 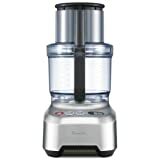 This 1200 watt food processor is perfect for those looking to save time in the kitchen, while still enjoying fantastic homemade meals. The Breville Sous Chef food process provides its users with a lot of versatility and convenience. With two bowl sizes and 24 slicing settings, you will not be left wanting. From making baby food to kneading bread to grating cheese, to making dips and salsas the Breville 16 cup food processor can help you get the job done. Plus, its 1-year limited warranty and 25-year warranty on the motor allows you to buy this product with peace of mind. Breville has been creating and perfecting small kitchen appliances for over 80 years. Their attention to detail and care for their products is seen in the Breville BFP800XL. If you’re looking for a powerful and effective food processor that also allows for easy clean up, the Breville Sous Chef should be at the top of your list. Read Next: Cuisinart prep 7 Cup Food Processor Review: Is It Worth It?